The above excerpt is what Shyam wrote on the very first issue of the NELTAChoutari in January 2009. Prem was in London, Shyam was in Kentucky, and Bal was in the middle of the Pacific in Honolulu, Hawaii. Before we gave birth to the Choutari, three of us used to exchange chains of emails looking for ways to get reconnected to our beloved Nepalese ELT community even if we were physically disconnected. Nelta Choutari was an outcome of that motivation and interest toward taking our ideas outside of our personal spaces (email) to a “choutari” (for those who don’t know this Nepali word, it’s the platform under/along with a tree, in or on the way to a village). In due course, three colleagues, Sajan Kumar Karn, Hem Raj Kafle, and Kamal Poudel joined the forum as moderators and connected Chouatri to the ELT community across the country back home; with their extensive experiences working with NELTA and its branches, affiliation with universities in Kathmandu and beyond, and added knowledge and skills in the field, the new colleagues helped take Choutari to its next level. Choutari was also the product of increasing interaction between ELT and technology. But as we witnessed how technology was largely redefining ELT and professional networking across the world–through such affordances as online discussions, professional email listservs, Facebook updates and comments, online teaching and training, and so on–we also realized that technologies such as blogging were not penetrating very deep in Nepal, partly due to the lack of widespread access to the web and partly due to the academic systems that do not encourage individual teachers and schools toward educational innovation through ICTs. However, we were driven by the idea that we cannot wait until the house catches fire for the Nepalese ELT community to start talking about technology in ELT and education. So, we paid some attention to the subject of technology itself as well as using it as a vehicle of our discussions of all kinds of issues in the village yard. More broadly, the main objective to establish the Choutari was to provide a professional space in which ELT practitioners across Nepal could learn by exchanging what we know and generate new knowledge from the bottom up. We wanted to promote local ELT scholarship through critical academic discussions; as some of our earliest posts (which we started publishing as monthly issues and called Choutari a “blog-zine”) indicate, we were interested in injected critical discussions on issues like critical pedagogy, the politics of language and ideologies undergirding language policies, the place of ELT in the bigger picture of education, democratization and decentralization of scholarship, and so on. One of our most passionate interests has been to let our colleagues at the grassroots level speak up as teacher-scholars through this forum. In our attempt to bring out the voices of teacher-scholars across Nepal, we have tried to publish oral interviews, branch updates, success stories, personal teaching anecdotes, and even classroom humor from colleagues from NELTA branches. Not all the “columns” we tried were successful, but we believe we have excelled in publishing issues with a good variety of materials. We have spent hours and days discussing what kinds of posts and publications would cater to the needs and interests of our readers. Thanks to Skype, we have conducted several conference calls, argued for the best possible alternatives, constructively criticized each other’s ideas, and eventually formed consensus. Choutari has come a long way and there certainly have been a few good challenges along the way. Often we would come up with brilliant ideas and try to implement them but some things didn’t go as well as we hoped. Our contributors, as well as we the coordinators, are very busy, and so participation has often been a challenge. For example, out of ten potential contributors we communicated to, seven would respond and five of them would promise to contribute a piece by the end of the month. When sent a second or third email, some of them either would not respond or would postpone their contribution for the following month. One or two of them would send the entry. However, we always remained confident and enthusiastic and we are grateful to many colleagues who continued to contribute entries and comments. We are particularly grateful to a few wonderful and regular contributors who promptly responded to our requests, and sent the entries by the deadline. They were instrumental in keeping this blog alive. We also owe special thanks to a few NELTA leaders like Ganga Gautam who contributed content (including this interview) and provided great encouragement during and after his presidency. Our colleague Kamal Poudel joined us as a liaison of NELTA; with him on board, we began to conceptualize the idea of NELTA networking, a larger framework that would consist of blogging (Choutari), microblogging (Twitter), social networking (Facebook), content creation (wiki for branches), and so on. We have also tried to connect Choutari to the larger world of ELT conversations. 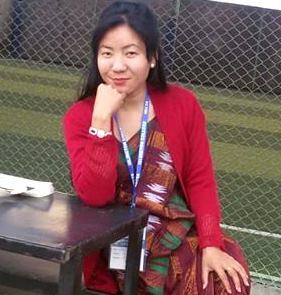 For example, by blogging for the IATEFL conference in Glasgow in 2011, Choutari became an IATEFL registered online blogger; this kind of international networking is another area for further exploration for the growth of Choutari and other professional networking platforms in Nepalese ELT. We believe that Choutari serves an important but a specific purpose (of being a space for discussing ELT issues); but we have always viewed this work not only an independent but well-aligned project that is meant to help fulfill NELTA’s central mission of promoting scholarship and professionalism. Furthermore, as indicated above, we have also viewed Choutari as a part of a potentially much larger substance-based professional networking initiative that can help NELTA fulfill its key missions. We have discussed the larger project extensively and it remains a great potential; as we hand over one successful part of that larger mission to a new group of ELT professionals, we are willing to further engage in that larger discussion with the new colleagues, NELTA leaders, and/or any other volunteer colleagues within the organization. We may not be able to dedicate as much time as we have the past four years but we remain as passionate as ever for contributing new ideas and helping to enhance Nepal’s ELT–its scholarship, professionalization, as well as its pedagogy–as much as we can. What I am saying is our full dependence on global methods, norms and textbooks in ELT may not help to promote and sustain our identities and treasure of local knowledge. What I am saying is that we have wonderful ELT practices that we are not able to share with the people from other parts of the world which we need to do urgently. Reflecting on his own dilemma created by the tensions between global and local and theory and practice, M. Kafle (November, 2012), S. Adhikari (August, 2012); Regmi (4/2011) and Limbu (March, 2012), deconstruct the notion of top-down literacy and pedagogical practices in English language teaching. While M. Kafle argues that we should critically look at whether or not the way we teach should foster ‘semiotic process’ and ‘creative languaging’, focusing on the intelligibility, S. Adhikari argues that any varieties (not only British or American) which help us establish communication ‘emancipate us from western centred linguistic imperialism’. Viewing from the perspective of global and local divide thanks to digital advancement, Limbu calls for teachers’ agency and collegiality to deconstruct dominant globalized pedagogical practice and look for opportunities that foster democratic pedagogies in which both local and global can go together. In this regard, quite related to H. Kafle’s (October, 2012) call for ‘interdisciplinarity’, Bhattarai and Yadav (November, 2012) and Sharma and Phyak (August, 2012) have worked with teachers on how different social issues like gender, poverty, child labor, human rights, and pollution can be brought into the classroom and help children find a creative space for capitalizing both local and global literacy practices. Teachers’ professional development: We received an encouraging number of posts on teachers’ professional development ranging from classroom practices to strengthening teachers’ associations. While M. Adhikari (January, 2012) suggests ways to deal with mixed ability classes, Ray (2012) critically unravels the tension between teachers’ motive for the monetary gain and professional development. In the similar fashion, Shrestha (September, 2012) and Panta (September, 2012) contend that present teacher training programs in Nepal lack both expertise and atmosphere for their implementation. Suggesting that observation servers as an important tool for teacher development, KC (October, 2012) and Bhusal (October, 2011) present various ways for engaging teachers in effective classroom observation practices while Budha (October, 2011) focuses on the role of reflective practice in teacher development. Other posts (not mentioned here, due to space limitation ) deal with designing tasks, organizing communicative activities, lesson planning, teaching writing and conference reflections. Together, these posts have provided ideas for the bottom-up and critical perspective on teacher development. Teachers’ narrative: This is the most popular theme in our webzine. Teachers’ personal narratives (e.g., Bashyal, 10/2012; Dahal, 10/2012; Gautam, 7/2011; Khati & Shrestha 10/2012; Rijal, 11/2012; Neupane, 8/2012; Wagley, 3/2011) have provided an important impetus to make the webzine one of the most popular blogs in Nepalese ELT communities. By including the interviews of teachers (initiated by Heml Kafle) working at the different levels of education, we have tried to bridge the gap between the notions of language-teaching-as-it-is-perceived and language-teaching-as-it-is-practiced. We are able to draw on creative writing works (e.g., Dewan, 3/2012) to help students use English in creative ways (please search Andrew Wright’s post in Chouatri). The key issues that emerge from teacher’s narratives are: (a) to what extent we are able to utilize our own literacy practices? ; (b) to what degree we are able to address student needs and contextual challenges? ; and (c) can we teacher narratives’ be base for promoting local ELT scholarships?. We think that future discussion should go in this line. We see that teachers’ narratives about teaching, learning and attending conferences and workshops may provide an important avenue for looking at what is possible to apply in our own context. Teacher training: We also received a significant numbers of posts on teacher training and workshop report. Ranging from Tanahun (e.g., Pandey, 3/2012; Nidhi, 9/2012) to Rautahat to Ramechhap we were able to cover branch updates and their activities. These updates not only tell us about what is happening in different branches, but also contribute to generate discussions on teacher training, classroom practices and organizing conferences. However, we are not able to report on whether or not the training programs NELTA has conducted have been translated into practice. We think that this is one of the key areas we should explore in future. I completely agree with Leknath on the importance of programmes like SQC to encourage linguistic formulation of ideas, in an age appropriate way. Circle time can start with KG children, in a simple story and discussion, with both topics and language being extended according to developmental level. (Refer to work of developmental psychologists Piaget and Vygotsky.) In UK, we are encouraging both creative and critical thinking programmes. Some are based on the work of Reuven Feuerstein who developed content-free thinking programmes, one is called Philosophy for Children, P4C, based on the work of Matthew Lipman. Some people were outraged at the idea of children ‘doing’ philosophy, but it is simply a structured way of unpicking an issue at the level the children are at at the time and extending both their thinking and their language. How can we be expected to develop our own language, let alone a foreign language, without widening concepts. I am deeply grateful to the readers and colleagues in this choutari. The write up that was posted over a year back is still drawing interest. This shows there is something in SQC. In fact, SQC is a complete package which includes all the issues like critical thinking, teamwork, developing language skills etc. which are quite common themes in ELT and other fields of academia. Officers Department of Education, Ministry of Education,GoN are also getting interested in this. The best thing is it canbe practiced in a well resourced school and quite underresourced school or college as well. Language is also not a barrier.You can do it in any language be it English or Nepali or even in any mother tongue.You just have to learn the systematic problem solving approach, tools and techniques that we teach and then you can adopt it to your own situation. …. In addition to these themes, we have also included expert’s interviews in which Professor Jai Raj Awasthi, Professor Govinda Raj Bhattarai, Professor Tirth Raj Khaniya, Professor Chandreshwar Mishra and Dr. Vishnu Singh Rai have shared their opinions about recent developments in ELT, language testing, language-literature-creative-writing. We also have teaching tips and classroom humors (though we do not have many) which can be useful for making classroom teaching effective. With this anniversary issue, we have handed over our legacy to a new vibrant team of young professionals, both fresh and seasoned, who have a strong commitment to collaborate with fellow ELT professionals, solicit contributions from practitioners from the grassroots level as well as publicize it as a global academic forum reaching out to hundreds of readers worldwide. The strongest aspect of the new team has to be able to work with the teachers in NELTA branches and bring their professional voices to the public. Teaching experiences and pedagogical practices are valued more when they are shared, replicated and experimented by the fellow practitioners. Thanks to multiple blogs and wiki applications! Those teachers who, for some reasons, cannot contribute their posts in writing can send their oral anecdotes and narratives to the editors who can easily upload them online. Four key words we want to emphasize and pass on to the new team are: sustainability, collaboration, variety, and coverage. NELTA Choutari should not die, nor should it be weakened in the future. Since we believe in democratic academic culture, we strongly believe in the principle of systematic entry into and exit from this forum although we did not start with any formal constitution. Although there is no such formal rules in this forum, we are guided with academic multiculturalism in which we enjoy working with different conflicting views, reflect each other’s perspectives, and think of grooming new colleagues, who could lead the webzine in future. Thank you to all new team members who accepted to take this challenging academic responsibility further. In this four years, six of us spent our valuable time and had a very productive experience, learning from each other and from the readers. The new team that starts at the dawn of new year can continue the legacy that are worth continuing, amend the tradition for a good cause and prepare next generation of who will replace them when time comes. Second, there is a lot to be done regarding collaboration. Our attempt and success to get the IATEFL blogger registration was one example. We also believe that Choutari can and should collaborate with local ELT branches, other organizations that have ELT as part of their mission, and other international ELT forums. It will be an appreciative task to invite contributions from writers from around the world; to ask them to share their experiences and anecdotes; and to encourage them to respond to the posts we share. When NELTA members travel to other professional venues such as IATEFL, TESOL, and other regional and local conferences, it is important to highlight what we have achieved so far from this forum. Third, we believe that readers always want varieties. Varieties can be in the themes or they can be in the modalities such as visual, oral, animations, images, and so on. Multimodality is something we tried but were not able to present as expected. Pictures of classrooms, videos of good teaching practices, and audio of teacher narratives, for example, are some of the wonderful examples in creating diversity in publication. Four, our subscribers should be in rise. Since technology and the internet has hit almost every regions of the country, local teachers should be aware of the fact that their fellow teachers have a professional khurak to share so that they do not always have to depend on international/foreign practitioners and writers. In addition, getting the Choutari entries to offline in printed format such as in the form of newsletters or small-scale journals would expand its horizon of coverage. This has already been started by our colleagues such as Sajan Kumar Karn and Dinesh Thapa. We always have to remember that we are doing everything for our fellow readers/teachers and they are the center of this project. We wish successful collaboration among the new team to publish Choutari. Thank you once again for accepting our proposal to take the legacy we have initiated ahead. Please let us know how we can be of your help. We also urge the rest of NELTA community and readers beyond this organization to please continue to contribute to this wonderful venue in any way you can. We did it for fun and we are convinced that it was absolutely worth our time and energy and we can assure you that if you can spare the time and energy to join this conversation, you will find it satisfying as well! A Very Happy New Year 2013 to you all. I don’t visit NELTA Choutari too often, but when I do, I get glued to it by its richness and its freshness. I would especially like to commend the works initiated and standard set by the ‘former’ editorial team of Shyam Sharma, Prem Phyak and Balkrishna Sharma, Sajan Karna, Kamal Poudel and Hem Kafle. This Choutari has benefited especially from the energy and knowledge and skill and passion of Shyam. Of late, I have moved a little away from ELT and Linguistics and ventured into the area of Quality Circle. I have been just carried away by this mission as I have seen the positive effects of this academic movement. I have taught/trained many teachers and students on this and at the same time I have learned a lot from the great gurus of the world and also from my own experience and reflection. Toward the end of the last year (2012) I have been able to introduce this concept in the Higher Secondary Education Board, Nepal’s Integrated Teaching Skills Training (I gave a session on this to teachers of 64 schools from Palpa district in November) and I have also introduced this to my MA students in my Central Department of Linguistics in Tribhuvan University from this session. I am happy that the students are eager to learn new and positive things. I would especially like to thank Shyam for coaxing me to write on SQC for this platform and am satisfied with the interest it generated. This is all that it could do. The action happens outside this forum in the real world. Now the onus is on the new team of editors to take it to greater heights and raise more awareness about ELT and Pedagogy and be an instrument of transformation. With their experience and expertise it can be expected that they will be able to inject some fresh air into the ongoing success of this platform. Wishing you all Happy New Year and Happy ELTing!!! Thank you very much for this tracing this genealogy for NELTA Choutari. To borrow from Mingolo, to speak of present, one should learn of past. Choutari has already reached of age, and it might be difficult for new members to browse through all the entries, especially for many of our readers who have to confront the bitter reality of maddeningly long power-cuts as well as lack of mediating technological affordances. Therefore, my kudos to you and the whole team for envisioning, and carving out an intellectually stimulating forum like this. Muri muri dhanyabad!